From TBWA, Paris, comes ‘Santabasco’, a play on the effects of Tabasco sauce for Christmas 2005. 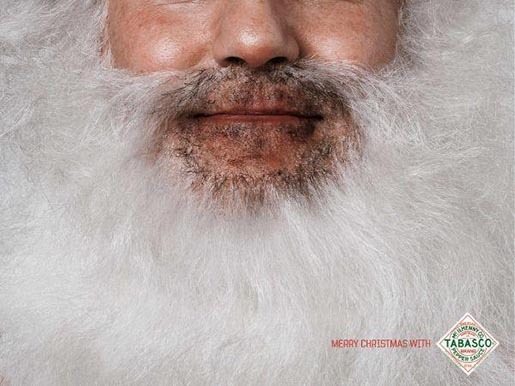 The idea for this ad was to take advantage of the warm, delicious atmosphere of Christmas to talk about a very warm, delicious product: Tabasco. Santa Claus, the symbolic character of the season, loves fire. He is not afraid of burning his behind when he comes down the chimney, and he is not afraid of burning his whiskers when eating Tabasco sauce. It may be cold outside, but thanks to Tabasco it is very warm inside. The “Santabasco” ad was developed at TBWA\France, Paris, by creative director Erik Vervroegen, copywriter Benoit Leroux, art director Philippe Taroux, and photographer Bruno Clement.